Information The game is indicated. 8.22 points at 37 votes (rank 50). The sorcerer Drax has a crush on Mariana, Princess of the Jewel city. He threatens the inhabitants of this city with destruction, if he doesn't get the princess. But there's a way to prevent the princess to be taken by Drax. Drax is very belligerent, and can be challenged by anyone to a duel with swords. Nobody dares to challenge Drax, nobody but a barbarian from the mountainous wastelands of the north, a skilled swordsman who can be persuaded to fight Drax. 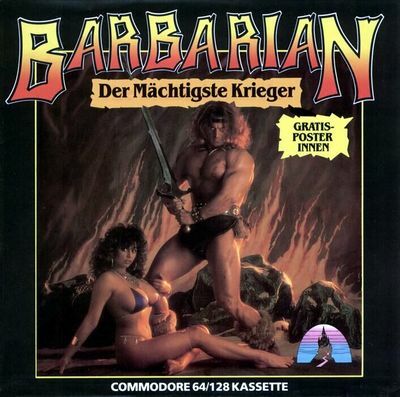 Barbarian is divided into two parts which must be loaded individually. In the first part (Practice) you can practice with different opponents, to familiarize yourselve with the controls and gameplay. In this section, two players can fight in a tournament. In the second part (Tournament), you have to fight for the princess. You need to prevail against a number of different fighters and finally defeat Drax, the sorcerer. 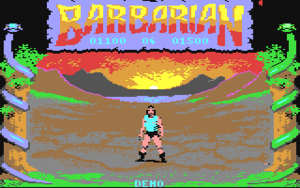 The barbarian character knows sixteen different offensive and/or defensive moves. At the right top and left top of the screen you will see the energy of the players indicated by red dots. Depending on the type and strength of a successful attack, the attacked player looses a half or a full point. A player is defeated when his energy has depleted, or he dies another gruesome way. These controls apply when the player faces left. If the player faces right, controls are mirrored. Just slay all your opponents. When you finally meet Drax, he starts throwing Shurikens (Ninja stars) at you. While dodging those by jumping and kneeling, move slowly towards Drax. When you close enough, roll towards Drax and pray for a Shuriken to take the highway. H.T.W: "A game with easy to learn controls, a great two-player mode, relatively good graphics and an excellent cover of Maria Whittaker. The gag with the severed head gets funny when the green gnome comes by and is nowadays probably only to smile. Unfortunately, a high score list is missing. Nevertheless, it is for me, apart from International Karate, the most played fighting game." TheRyk: "Never slaughter was more beautiful on the C64. Considering violent game content on modern systems, it is hard to believe that the "head off" was shocking enough in the 1980s for the game to be banned in Germany. 'What are you doing with that sword, speak!' shouted many parents when they saw the sword blow that decapitated the opponent. This often resulted in a Barbarian ban. That made the game even MORE fun. Besides this I have to add that the 6-minute game-music (see above) is super-class and adds up perfectly to the atmosphere. Also the opponent's AI, which gets better level by level, is very convincing. Nothing's better, 10 points !" Equinoxe: "The game caused a lot of controversy to us as teenagers. For that time, the graphics were great and then the 'head off' blow. The teenagers nowadays will probably show a weary smile, but for us it really was a trip... It did work for the long term, but only in 2-player mode, as the computer opponents in the tournament were so easy to defeat, that you reached the final boss Drax without any real problems. But Drax killed you in a blink of an eye. In the long run very frustrating. That's why only 6 of 10 points."